Mr. Leonel A.Guerrero, 83, passed away on Thursday, My 17, 2018 at Doctors Hospital at Renaissance in Edinburg. Leonel was born on August 10, 1934 in Reynosa Diaz, Tamps, Mexico to Martin and San Juanita (Olivarez) Guerrero. Leonel had lived in McAllen for 45 years of his life. Leonel was in construction for most of his life. 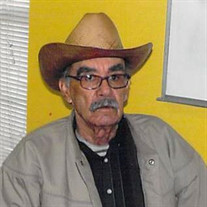 Leonel is survived by his wife: Micaela Villarreal Guerrero; two children; Leonel Guerrero, Jr. and Edna Coronel; sisters: Carmela Mariscal, Rosalinda Hernandez, Hermelida Gonzalez, Francisca Guerrero, Hilda Zamora, Alma Chapa and Almanelly Lozano; eight grandchildren and five great grandchildren. A gathering of family and friends will take place on Saturday, May 19, 2018 from 3:00 pm to 9:00 pm and Sunday, May 20, 2018 from 1:00 pm to 9:00 pm with a rosary at 7:30 pm at Rivera Funeral Home in McAllen. Funeral services will take place on Monday, May 21, 2018 at 10:00 am at Rivera Funeral Home. Burial will follow to La Piedad Cemetery in McAllen.